New York Times bestselling author and leadership trainer says: Getting your employees to do their work shouldn't have to be so much, well, work! For years now, leaders in almost every industry have accepted two completely false assumptions - that change is hard, and that engagement drives results. Those beliefs have inspired expensive attempts to shield employees from change, involve them in high-level decision-making, and keep them happy with endless satisfaction surveys and workplace perks. But what these engagement programs actually do, Cy Wakeman says, is inflate expectations and sow unhappiness, leaving employees unprepared to adapt to even minor changes necessary to the organization's survival. Rather than driving performance and boosting efficiency, these programs fuel entitlement and drama, costing millions in time and profit. 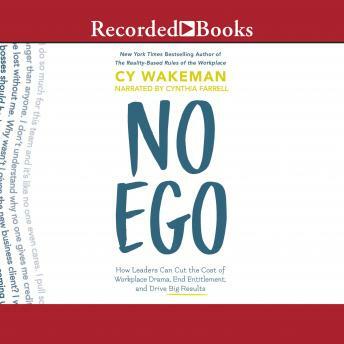 No Ego is about increasing awareness of just how often individuals are operating out of ego at work, breeding drama and discord rather than innovation and constructive collaboration. It is high time to reinvent leadership thinking. The current work experience is so full of emotional waste that it's seen as a foregone cost in today's business environments. Cy Wakeman teaches straightforward strategies in which this time and energy can be re-commissioned and put toward the value that hired talent is intended to provide. No Ego disposes with unproven HR maxims, and instead offers a complete plan to turn your office from a den of discontent into a highly productive place where happy employees are accountable employees.